Please note: This mattress requires a prescription from a licensed physician for purchase. Simple and supportive, yet oh-so-soft and pure — our Green Cotton and Latex Mattresses were made for healthy sleep, inside and out. Made with endless fluffy layers of our special blend of Green Cotton and an Evergreen Foam core, our natural mattresses are free from dyes, perfumes, and chemical processes. From babies to bad backs, every body loves the simplicity of this classic design. 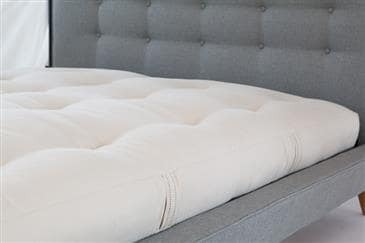 Softer than our Cotton and Wool Dreamton mattresses because of the addition of our Evergreen Foam, this mattress provides medium-firm support, with a sink-into-it softness you’ll love. From Cot to California King — and in custom sizes, too — these natural mattresses offer an eco-friendly and hypoallergenic alternative in almost every size. Most foams are made of petroleum-based products that produce toxic off-gassing and create a lot of environmental pollution. A more affordable option to our organic cotton products, our Green Cotton is grown in the United States — it just isn’t certified organic. Grown by farmers right here in the US, Green Cotton is a fabulous cost-savings material that doesn’t put you in contact with harmful chemicals typically found in conventional cotton. The Green Cotton and Evergreen Foam Mattress is one without springs, and as such won’t transfer motion between sleepers. 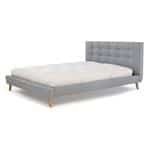 We recommend putting it on a box spring set or platform bed, or even using it as a floor bed. A slatted bed frame is recommended for air circulation and the slats should be at least 2.5" wide and no more than 2" apart from each other. When the slats are more than 2" apart, that may affect the longevity and comfort of your mattress. Soft yet supportive, our Green Cotton and Evergreen Foam mattress is unlike any you’ve ever slept on, and we know you’re going to love it. Please note: This mattress requires a prescription from a licensed physician for purchase. After purchase, please fax, email, or mail a copy of your prescription in a timely manner, so that we can begin handcrafting your mattress. Living on a budget in Cambridge seems a necessity for the average millennial. After accounting for rent, food, a T-pass and other sine qua nons, apartment furnishings seemed rather elusive. Couple the razor thin budget with the desire for an eco-friendly piece and one severely narrows the universe of alternatives. Happily, I can say, this piece fits the bill. Pair it with the right futon frame or use it unassisted as a crash pad for those pesky relatives visiting from afar. They may not be able to get up if you stick them on the floor, but they won’t want to because this mattress is immensely comfortable! Hopefully this helps you make a more informed, environmentally responsible purchasing decision. Cheers! Hi, do you still make a green cotton foam core futon with boric acid as a fire retardant? If so, can you tell me how much it would cost for a queen size 6 inch? Thanks. 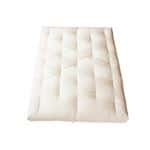 Here is the link to the Green Cotton Foam Core Mattress with fire retardant. The cost for a Queen 6" is $917, we can send you a quote to your email if you would like.